They offer their holiday citizens an excellent programme of events and activities, 365 days a year. In the winter, the Free Republic of Holidays is a haven for winter sports fans everywhere. SAAS-FEE is one of the OTP Premier Resorts, with our own experienced Resort Managers meeting you, taking you to your accommodation, handing you your ski passes & rental equipment and skiing with you if you would like to be shown the amazing ski area. In OTP Premier Resorts we offer hotels, self-catered accommodation and also an option of CATERED accommodation with 4+ persons. Saas-Fee is a car free resort, meaning all fuel vehicles are parked at the entrance to the village and then leaving you relaxed and free to wander across the whole resort. It also means the air is very clean and the atmosphere is very quiet. The village is very picturesque and still holds a lot of the charm you would expect from a Swiss hamlet. The main street runs through the centre of the village and is still decorated with the classic cobblestones. All your amenities are based around this centre and strolling outside of this centre takes you into the outskirts of the town, where there are traditional building with gardens and a lot of space, somewhat of a rarity in many of the ski resorts. Saas-Grund is the little village just before Saas-Fee. It has a lot quieter feel to Saas-Fee and is often used as a base for winter walkers. The new 1,200m high wellness and activity trail on Kreuzboden offers visitors a great chance to hone their senses and take some time out for quiet reflection. Adults and kids alike will enjoy wading through icy-cold streams, drinking crystal-clear glacier water, crossing rope bridges, rafting across the mountain lake and listening to bubbling mountain springs. Your taste buds are in for a treat here in the Saas Valley, with over 100 restaurants serving a wide variety of cuisine ranging from hearty Swiss and Valais specialities served in very quaint cafés offering good honest food to fine gourmet cuisine from Europe and around the world. For those after a quick bite between the bars there are the Alpine standard, of pizzerias, offering cheap, quick but very good pizzas. Saas-Fee has a fairly lively après ski scene. There are plenty of bars based around the bottom of the slopes to help you ease into the evening. Once that has happened, the little streets become alive and around 20 bars will take the evening into night. There are quiet little bars and restaurants to relax in or heavy and lively nightclubs for the more energetic. All skiers and snowboarders of all levels will find something in the Saas Valley to suit their needs. With a massive number of pistes ranging up to 3,600m you can always be sure of snow. Most of the lower slopes down from the snow sure glacier are serviced by around 100 snow cannons, ensuring that the descent down into the valley is covered in snow right up until the end of the season in late April. Saas-Fee is recognised as one of Switzerland's more family friendly ski resorts with lots of flat sunny slopes for beginners and plenty of supervised activities for children. There are endless off-piste opportunities in the Saas valley and for the adventurous ones, a short hike can lead to some amazing descents. Saas-Fee offers 22 lifts, including 3 cable cars, 1 funicular railway, 5 gondolas, 2 chairlifts and the remainder being draglifts, mainly on the glacier. 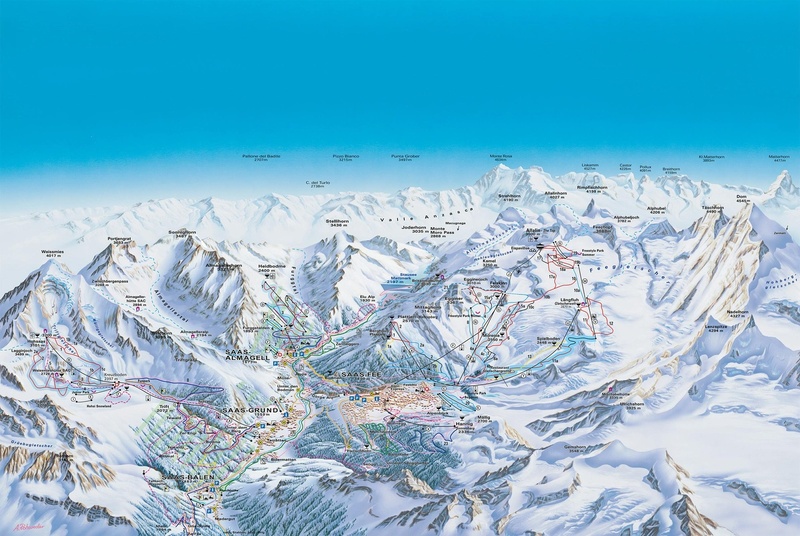 The ski pistes are split up into 30% beginner runs, 45% intermediate runs and 25% advanced. So it really is split up very nicely to suit everyone. There is a very good standard half pipe and park, there is a lot of freestyle camps ran throughout the winter and also the national ski teams use the glacier in the summer to practice for the upcoming winter. We use one of the top Sports Shops in Saas-Fee, Cesar and Alpin Sports. We have 2-person studio apartments and every size, right up to 14-person apartments. They are spacious and convenient to amenities, the ski lifts and free village ski bus. You can specify the standard and size of apartment or standard of hotel required on the Personal Quote Page. We respond personally to each request with availability, description, pictures and exact prices.